Orders must be received in the Home Office from noon, CST, March 1 through noon, CST, April 1, 2016. Note: Products and colors in packages are predetermined and may vary based on inventory availability. Spend $75 on Norwex products during the month of March, and you can purchase the blue Dusting Mitt for just $5! *Before shipping and handling & any applicable tax. **Available March 1, noon, CST - April 1, noon, CDT, 2016. $5 purchase does not count toward Host benefit calculations. 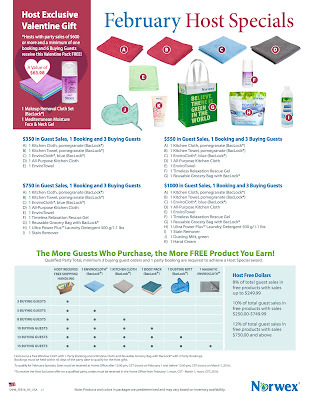 Limit one per qualified Customer/Host order. Order not available on bulk order party entry, supply or any web order. Offer will be displayed for order in the Discount & Special Order section of your party order once the $75 spend threshold has been met. Norwex reserves the right to substitute based on product availability. 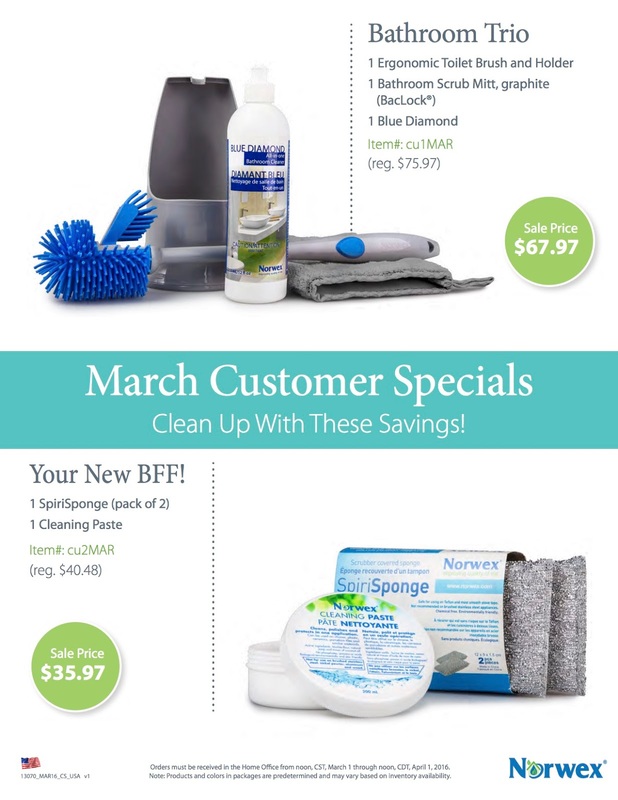 To qualify for March Specials: Sales must be received at Home Office after 12:00 pm, CST (noon) on March 1 and before 12:00 pm, CST (noon) on April1, 2016. 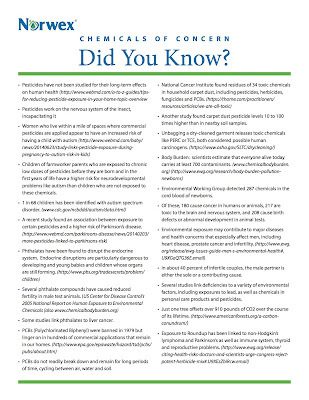 Chemicals of Concern - Did You Know? Children of farmworker parents who are exposed to chronic low doses of pesticides before they are born and in the first years of life have a higher risk for neurodevelopmental problems like autism than children who are not exposed to these chemicals. Some studies link phthalates to liver cancer. PCBs do not readily break down and remain for long periods of time, cycling between air, water and soil. Another study found carpet dust pesticide levels 10 to 100 times higher than in nearby soil samples. Of these, 180 cause cancer in humans or animals, 217 are toxic to the brain and nervous system, and 208 cause birth defects or abnormal development in animal tests. In about 40 percent of infertile couples, the male partner is either the sole or a contributing cause. 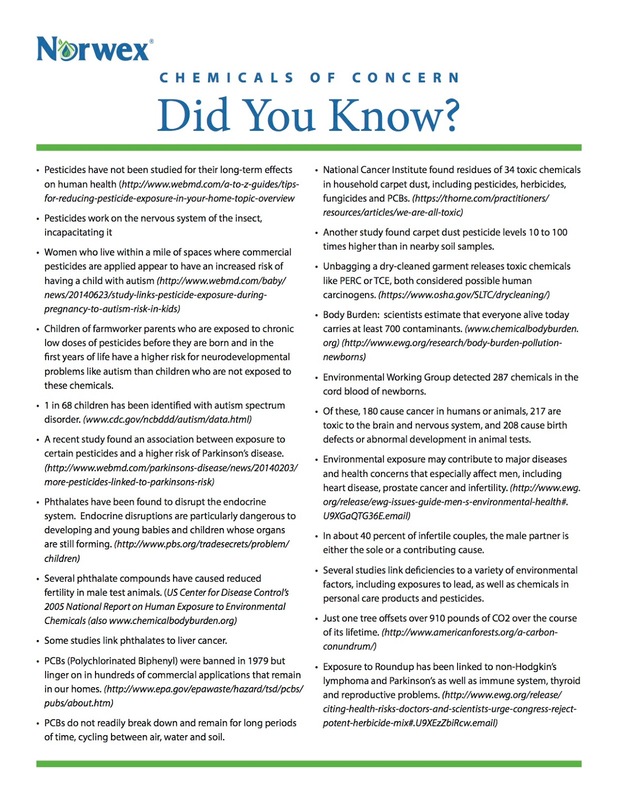 Several studies link deficiencies to a variety of environmental factors, including exposures to lead, as well as chemicals in personal care products and pesticides. 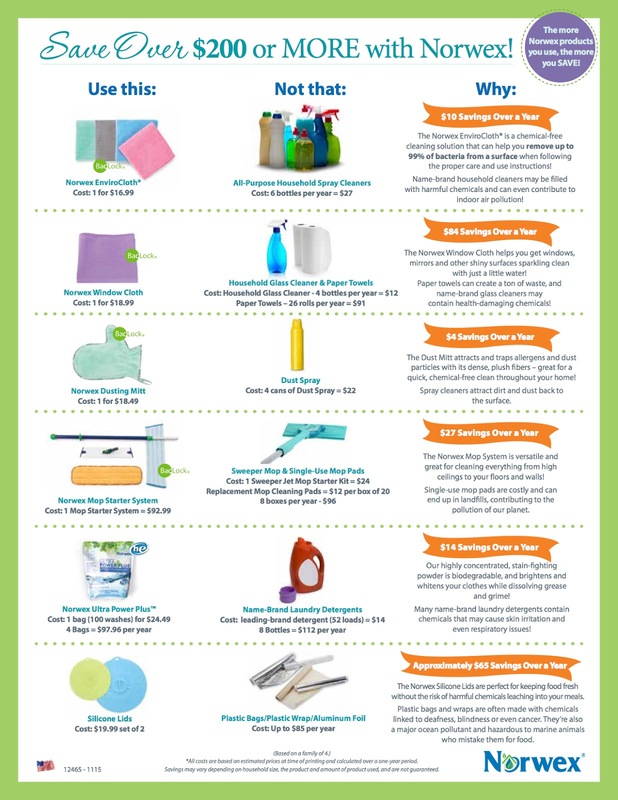 CLEAN EVERY SPACE IN YOUR HOME! 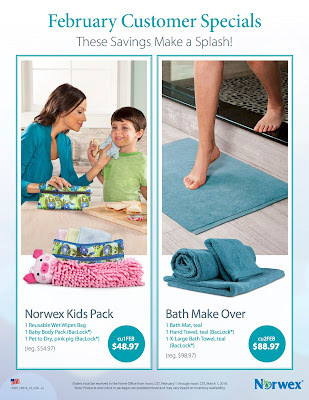 Clean every space in your home with just Norwex + water! 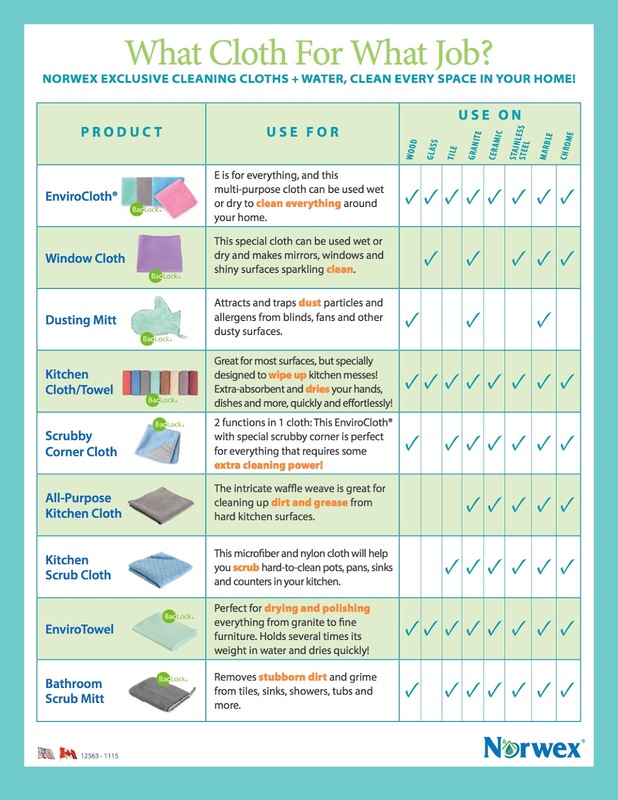 Use your Norwex EnviroCloth™ with BacLock™ on Everything (E for Enviro, E for Everything) - this multi-purpose cloth can be used wet or dry to clean everything around your home. Safe for use on wood, glass, tile, granite, ceramic, stainless steel, marble, and/or chrome. Use your Norwex Window Cloth with BacLock™ wet or dry to make mirrors, windows, and shiny surfaces sparkling clean. Safe for use on glass, granite, stainless steel, marble, and/or chrome. Use your Norwex Dusting Mitt with BacLock™ to attract and trap dust particles and allergens from blinds, fans, and other dusty surfaces. Safe for use on wood, granite, and/or marble. Use your Norwex Kitchen Cloth or Towel with BacLock™ which, while great on most surfaces, is specially designed to wipe up kitchen messes! 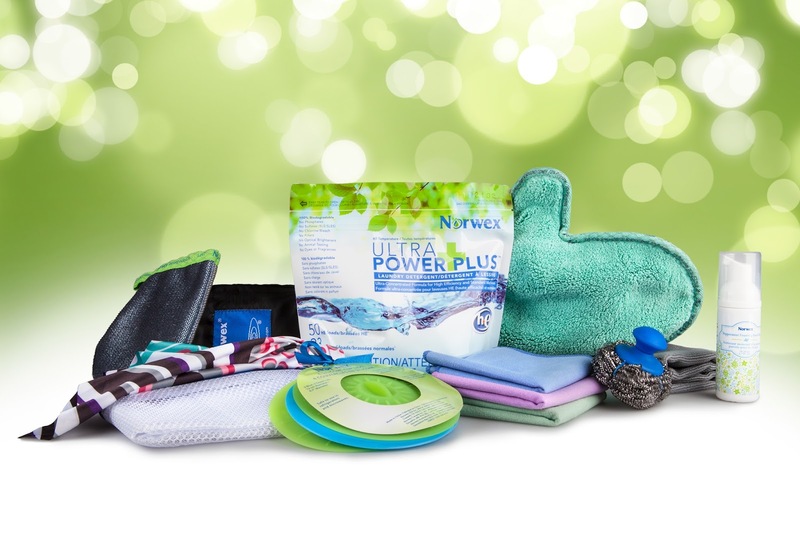 It is extra absorbent and dries your hands, dishes, and more both quickly and effortlessly! 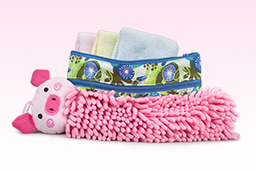 Use your Norwex Scrubby Corner Cloth with BacLock™ and take advantage of two functions in one cloth: This EnviroCloth™ with special scrubby corner is perfect for everything that requires some extra cleaning power! Safe for use on wood, tile, granite, ceramic, stainless steel, marble, and/or chrome. Use your Norwex All Purpose Kitchen Cloth has an intricate waffle weave to clean up dirt and grease from hard kitchen surfaces. Safe for use on granite, ceramic, stainless steel, marble, and/or chrome. Use your Norwex Kitchen Scrub Cloth with its microfiber and nylon cloth to help you scrub hard to clean pots, pans, sinks, and counters in your kitchen. Safe for use on tile, granite, ceramic, stainless steel, marble, and/or chrome. 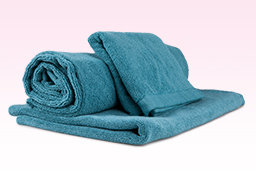 Use your Norwex EnviroTowel with BacLock™ as the perfect cloth for drying and polishing everything from granite to fine furniture. It even holds several times its weight in water and dries quickly! Use your Norwex Bathroom Scrub Mitt with BacLock™ to remove stubborn dirt and grime from tiles, sinks, showers, tubs, and more. 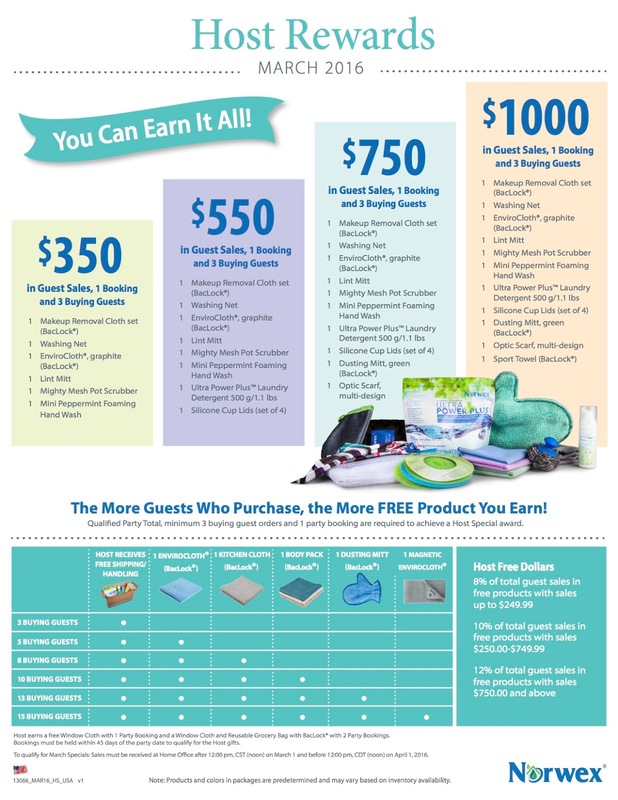 The more Norwex products you use, the more you SAVE! Savings by Using Norwex - Save Money While Using Norwex! $10 Savings Over a Year! 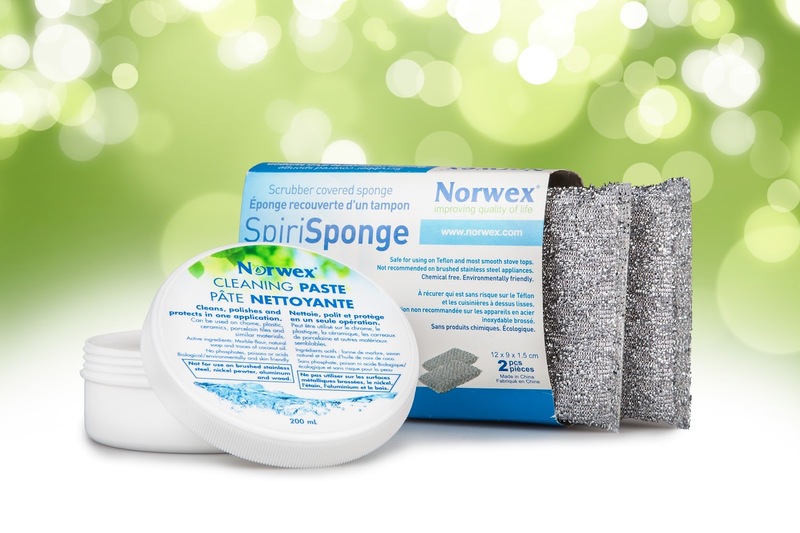 The Norwex EnviroCloth® is a chemical-free cleaning solution that can help you remove up to 99% of bacteria from a surface when following the proper care and use instructions! 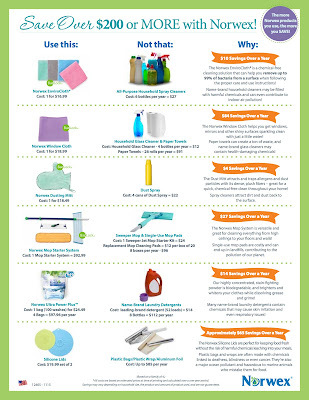 Name-brand household cleaners may be filled with harmful chemicals and can even contribute to indoor air pollution! $84 Savings Over a Year! The Norwex Window Cloth helps you get windows, mirrors and other shiny surfaces sparkling clean with just a little water! Paper towels can create a ton of waste, and name-brand glass cleaners may contain health-damaging chemicals! $4 Savings Over a Year! 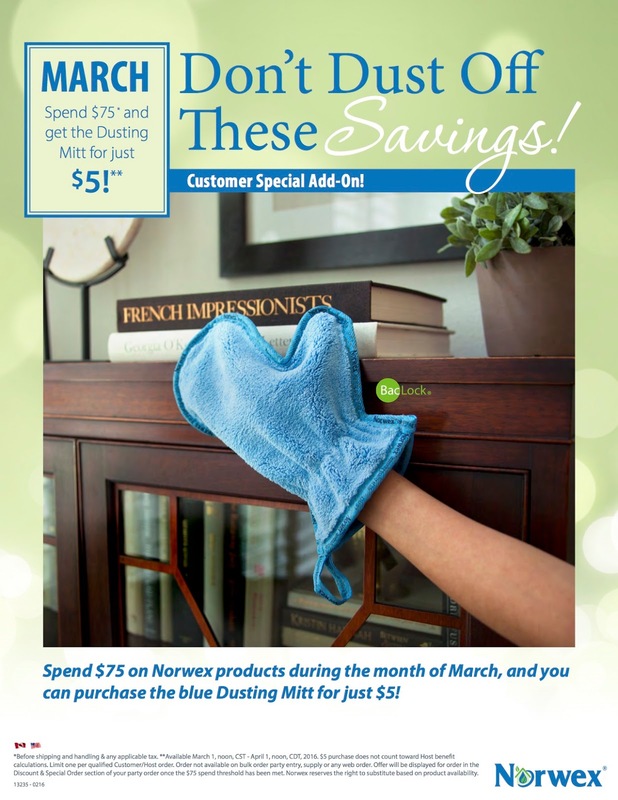 The Dust Mitt attracts and traps allergens and dust particles with its dense, plush fibers – great for a quick, chemical-free clean throughout your home! Spray cleaners attract dirt and dust back to the surface. $27 Savings Over a Year! 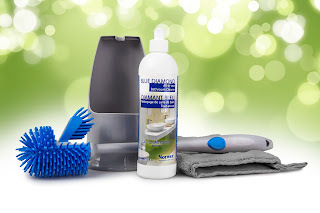 The Norwex Mop System is versatile and great for cleaning everything from high ceilings to your floors and walls! 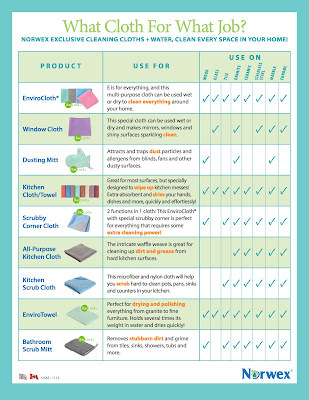 Single-use mop pads are costly and can end up in landfills, contributing to the pollution of our planet. $14 Savings Over a Year! Our highly concentrated, stain-fighting powder is biodegradable, and brightens and whitens your clothes while dissolving grease and grime! Many name-brand laundry detergents contain chemicals that may cause skin irritation and even respiratory issues! 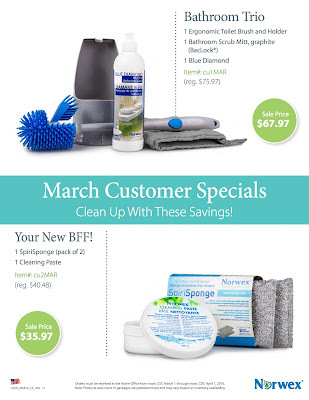 Approximately $65 Savings Over a Year! The Norwex Silicone Lids are perfect for keeping food fresh without the risk of harmful chemicals leaching into your meals. Plastic bags and wraps are often made with chemicals linked to deafness, blindness or even cancer. They’re also a major ocean pollutant and hazardous to marine animals who mistake them for food. Get your business started with the February Starter Kit Enhancement! 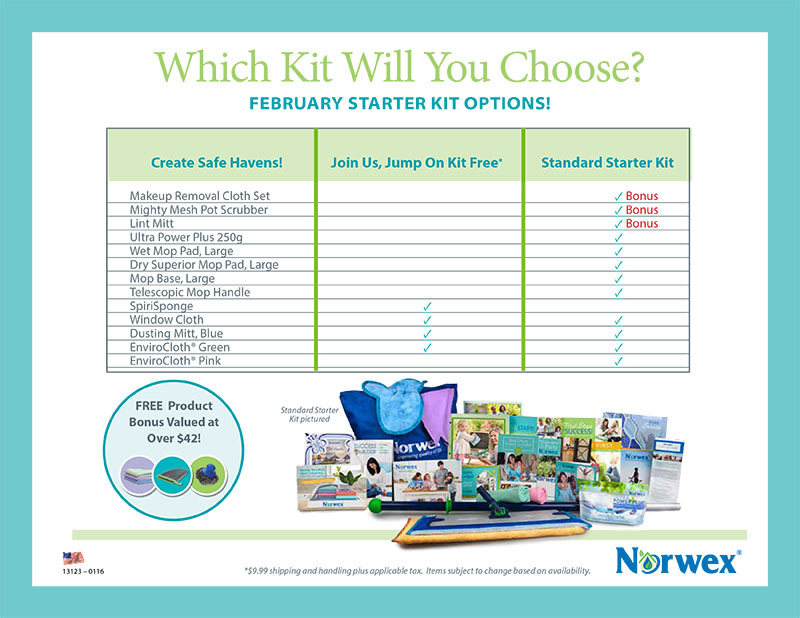 In February, the Norwex Standard Starter Kit comes with three additional items! 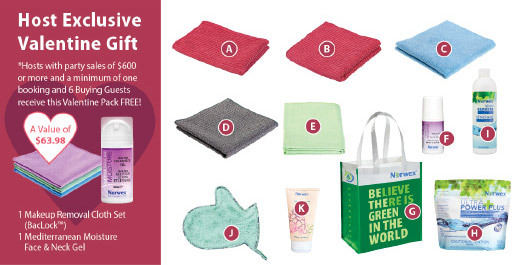 Receive the Makeup Removal Cloth Set, Lint Mitt, and Mighty Mesh Pot Scrubber FREE! Over $42 Retail Value! Kit Enhancement available on the Standard Starter Kit and Spanish $59.95 Kit from noon, CST, February 1 through noon, CST, March 1, 2016. Not available on the Join Us, Jump On Kit. Kit contents may vary based on availability. See your Consultant for the most up-to-date information. Join us and Jump On for FREE*! Limited Time Only! Offer expires at NOON Central Time March 16, 2016. 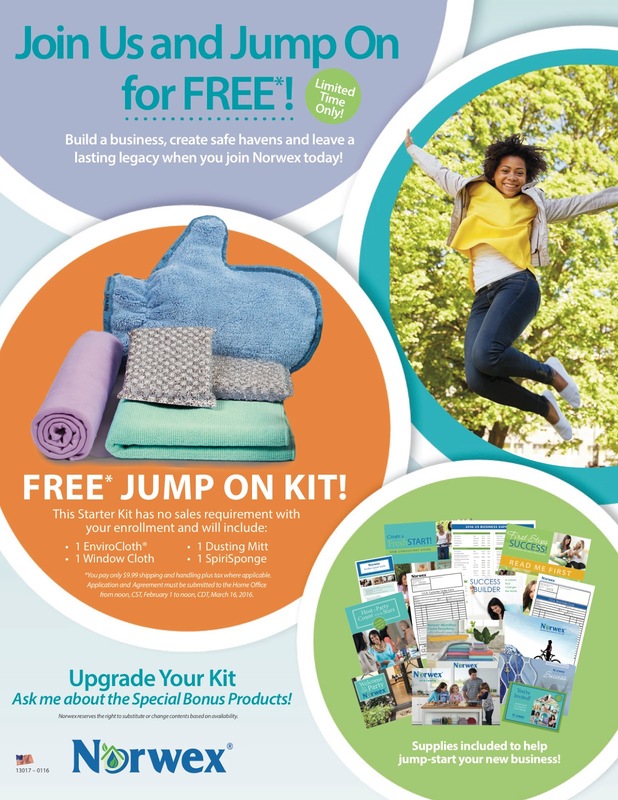 Build a business, create safe havens, and leave a lasting legacy when you join Norwex today! Norwex reserves the right to substitute or change contents based on availability. *You pay only $9.99 shipping and handling plus tax where applicable. Application and Agreement must be submitted to the Home Office from noon, CST, February 1 to noon, CST, March 16, 2016. 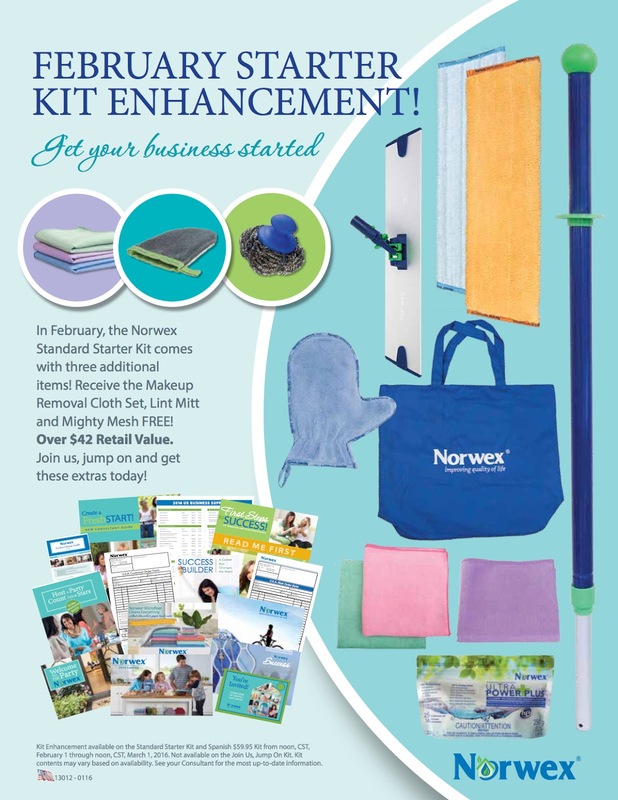 Or, choose the Standard Kit and receive a Bonus Kit Enhancement! 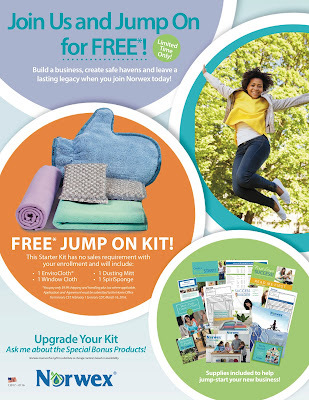 Upgrade Your Starter Kit At Sign-Up Only! 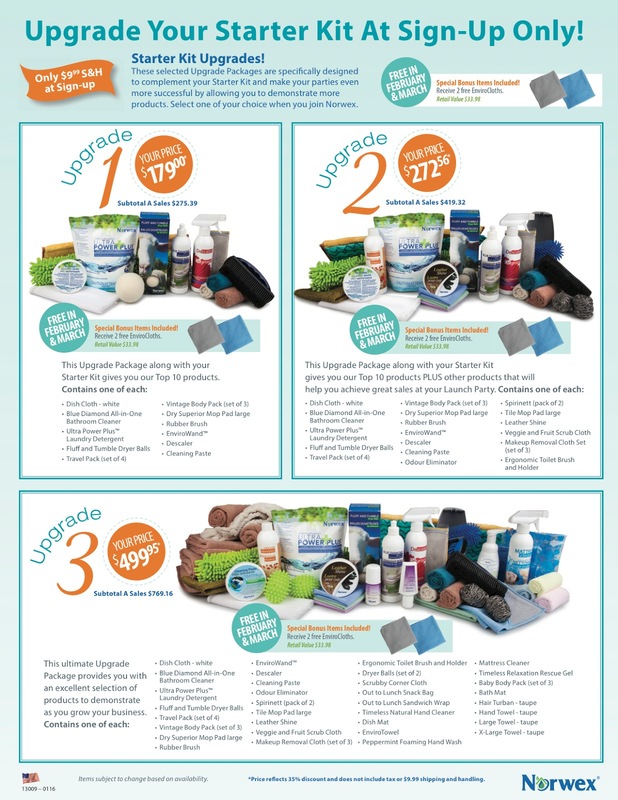 These selected Upgrade Packages are specifically designed to complement your Starter Kit and make your parties even more successful by allowing you to demonstrate more products. Select one of your choice when you join Norwex. Only $9.99 S&H at sign-up. *Price reflects 35% discount and does not include tax or $9.99 shipping and handling. Orders must be received in the Home Office from noon, CST, February 1 through noon, CST, March 1, 2016. Note: Products and colors in packages are predetermined and may vary based on inventory availability. To qualify for February Specials: Sales must be received at Home Office after 12:00 pm, CST (noon) on February 1 and before 12:00 pm, CST (noon) on March 1, 2016. *To receive the Host Exclusive offer on a qualified party, orders must be received in the Home Office from February 1, noon, CST - March 1, noon, CST, 2016.